A NOTE FROM LESLIE I t’s starting to warm up outside and we are all anxious to get outdoors and enjoy the sunshine . Weather you like to garden , bake or clean; this issue has something or everyone. Chef Kerry Dunnington shared three of her favorite recipes with us that are perfect for lighter eating. We also have some cleaning hacks that will get you through your day and outside with a glass of lemonade. I’m enjoying sharing all these great ideas for a cleaner, greener lifestyle. tTank you for coming along on the journey with me. I’m thankful for each and every one of you. RED CABBAGE SALAD WITH MANGO, AVOCADO, FETA AND CASHEWS 4 cups shredded red cabbage 1 cup cubed ripe mango 1 ripe avocado, cut into bite-sized pieces ½ red pepper, cut into bite-sized pieces 2 scallions (green onions), thinly sliced ½ cup crumbled feta cheese ½ cup roasted, salted cashews Salt and pepper, to taste 1. In a large bowl, gently toss the cabbage, mango, avocado, red pepper and scallions. 2. Lightly coat the salad with celery seed dressing and toss to combine evenly. 3. Toss in feta cheese and cashews and season with salt and pepper. Home cooking is the ideal way to nourish us: We can select healthy ingredients that support development, immunity, repair, and even detox certain toxic chemicals from our bodies. We can also have more control over materials that may contaminate our diet. While there are benefits to our abundant dietary choices, the wealth of options can be overwhelming and create confusion about how best to eat. The tips below make how to nourish our bodies and minimize toxic exposures from our diet more simple. Maximize your portion of plant-based meals and snacks. In addition to many studies that prove the benefits of a plant-based diet, certain toxicants are attracted to fat so their concentrations are higher in animals and their byproducts, as well as fatty seafood. So, by reducing your consumption of animal protein, you’re reducing your exposure to toxicants. By increasing your intake of vegetables, fruits, nuts, and whole grains, you’re also increasing nutrients that help your health’s resiliency. Maximize natural, whole foods; minimize processed foods. Minimizing processed foods will reduce your exposures to chemicals used as artificial additives and in packaging materials. budget, items that are higher in fat—dairy, meat, and poultry—and the Dirty Dozen, a list by the Environmental Working Group of produce with the highest levels of pesticides, should be placed higher on the priority list. Safer food and beverage containers are made of glass and stainless steel. Chemicals from packaging materials, like plastics, can leach chemicals into your food and drinks. Drink lots of filtered water. Use a filter that suits your water supply. Sophia Ruan Gushée is the author of A to Z of D-Toxing: The Ultimate Guide to Reducing Our Toxic Exposures, described as “a great guide for people to reduce their toxic exposures from consumer products” is available on Amazon. A Miracle Whitening Formula for Your Laundry By Leslie Reichert Miracle Laundry Whitening Formula for a top loading washing machine ¼ cup powdered automatic dish washing detergent ¼ powdered oxygen bleach or liquid chlorine bleach ¼ borax ¼ liquid or powder laundry soap Dissolve the powdered ingredients in 1/3 cup boiling water (boil in a microwave safe container until it reaches a full boil). Mix in the liquid ingredients and add the entire mixture to the water in the washing machine before placing the pillows in the water. Make sure the entire mixture is evenly distributed in the water. Wash at the hottest water setting and the highest spin cycle. Remove and place the pillows in the dryer with four dryer balls to make them dry faster and come out of the dryer nice and fluffy. Miracle Laundry Whitening Formula for a front loading washing machine 1 T powdered automatic dish washing detergent 1 T powdered oxygen bleach 1 T borax 1 T liquid laundry soap Dissolve the powdered ingredients in 1/3 cup boiling water (boil in a microwave safe container until it reaches a full boil). Mix in the liquid ingredients and add the entire mixture into the laundry soap dispenser in the machine. Wash at the hottest water setting and the highest spin cycle. Remove and place the pillows in the dryer with four dryer balls to make them dry faster and come out of the dryer nice and fluffy. What products are you using that contribute to poor air quality? When Providence-based journalist Frank Carini and marketing strategist Joanna Detz launched the nonprofit online news organization ecoRI News in 2009, they dreamed big but started small. Born of a perceived lack of reporting on environmental and social justice issues in southern New England, ecoRI News has quickly become the go-to environmental news source for Rhode Island lawmakers, policymakers, educators, scientists, activists, and citizens alike. "The region is facing so many big challenges related to climate change, food security and land use," said Detz, who is ecoRI News' executive director. "It is our role as journalists to give people the information they need to become better stewards of the environment and to hold policymakers accountable for the decisions they make." As the news organization grew, Carini and Detz decided they wanted to do more than just report on the environment. They wanted their organization to have a direct impact in Rhode Island communities through education and outreach. In 2010, they created a public outreach arm of ecoRI, which they charged with offline/real-world education. As part of this effort, staffers conduct educational presentations at schools and businesses about relevant environmental issues. In 2012, the organization gave more than 100 presentations to school kids about how to reduce waste at home by recycling and composting. In 2013, ecoRI launched a residential food-scrap collection program called ecoRI Earth that has diverted roughly 70,000 pounds of food scrap from the Central Landfill to small urban farms where the material is used to grow more local food. These outreach programs work in tandem with the news side of the organization to give citizens the information and the tools they need to become better stewards of the environment. ecoRI News, with a full-time staff of just four, is still small, but it is making a big difference in southern New England. Learn more at ecori.org. free receptacle that can easily be detached and refrigerated on its own. After it’s been properly chilled, the AquaTru has its own dispenser for convenient serving. Best of all, the AquaTru system removes over 100 toxic chemicals and heavy metals from tap water, and through its unique filtration process, is able to significantly reduce the concentration of many, many more. According to a recent lab test, the AquaTru system eliminated over 98% of eight toxic elements most commonly found in polluted water sources. How do you get it? Well, the AquaTru water filter system is so new that it's currently in preproduction, but it will be shipping to pre-order customers before the end of the year. 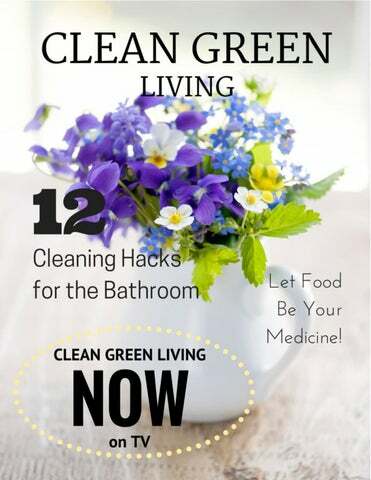 Clean Green Living readers can get a special discount of 40% off on orders placed before July 12th via this link. Don't wait! The pre-order price will NOT stay this low for long! Yes, I want perfectly clean water for my home! Celery Seed Dressing ⅓ cup sugar 1 teaspoon salt 1 teaspoon dry mustard 1 teaspoon freshly minced onion ¼ cup apple cider vinegar 1 cup canola or neutral oil 1 teaspoon celery seeds In a medium bowl, combine sugar, salt and dry mustard. Add onion and apple cider vinegar and whisk until sugar has dissolved. Slowly add oil and whisk until dressing thickens. Add celery seeds and whisk until well blended. Join us on a journey to a cleaner, greener lifestyle. From food, tips and decor - we have everything you need for a natural home.